We’ve all heard those quotes reminding us how the true test of one’s character is during hard times. Last week reminded me of how true this holds even in the case of inanimate Brands. Up until now, I genuinely believed this is common knowledge, and something every brand, every marketing team, and every social media community manager is aware of. Turns out, it isn’t. 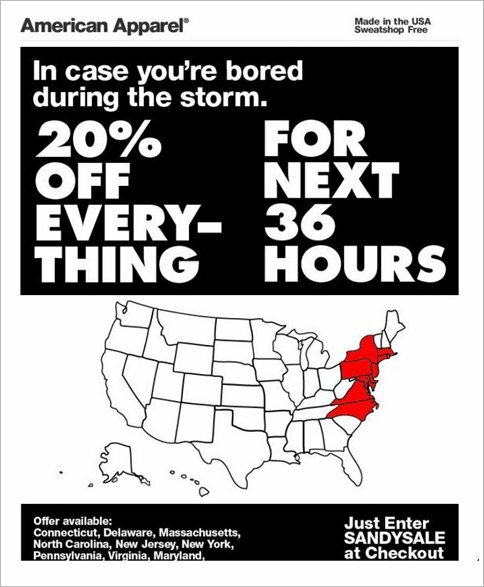 On October 29, while Hurricane Sandy was in devastating full swing and in the middle of its terrible rampage across nine states along the east coast, American Apparel sent out an email (included on the right) specifically targeted to consumers belonging to these nine states, inviting them to shop online in case they were ‘bored’ during the storm. No concerns about the well-being of their consumers mentioned, no help offered. Needless to say, Twittersphere exploded with criticism for AA, and this insensitive faux pas has brought some seriously bad PR to AA shores. While I do appreciate Mr. Charney’s commitment to constantly keeping an eye on the ball, he unfortunately doesn’t seem to acknowledge the fact that the “wheels of commerce” are the last thing on people’s minds when they’re going through a life-threatening natural calamity. And a result, a brand which blatantly admits it’s only thinking about keeping the cash registers ringing through rain, storm and disaster will obviously ruffle many feathers. Incidents like the above make American Apparel and Gap look like “bad person” brands who don’t really respect the feelings of their audience. And that may not bode very well for them, especially given how powerful negative word of mouth can be. In fact, according to a recent Retail industry roundup by About.com, a whopping 140 million people on Twitter found American Apparel’s Sandy Sale offensive and inappropriate. While we don’t have a way yet to directly translate this number into impact on sales, we can take it as a good indicator of purchase intent at the very least – which of course is by no means a number American Apparel could afford to risk. 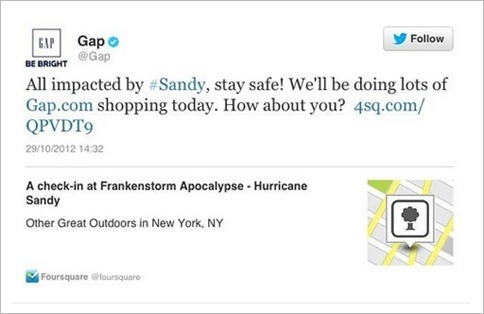 And Gap faced the music as well – featured below is just one among the several irate responses they received. In contrast, Starbucks has been surprisingly humane and empathetic pre and post Sandy. Yes, I say ‘surprisingly’ because of the reputation Starbucks earned for themselves following their indifferent treatment of the 9/11 rescue workers in NYC back in 2001. But that was then, this is now. 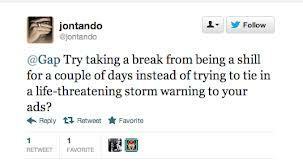 Not only did Starbucks announce they were shutting their stores early for the safety of their employees, but they also made sure their consumers knew they were being thought of, and their well-being was being hoped for, via their various social media channels. They also made sure consumers were kept posted on what Starbucks’ response was to the hurricane. In addition, post the storm, they also urged their audiences to make a contribution to Red Cross to help rebuild the areas affected by Sandy. How much of a tangible difference does all this really make to the lives of people actually affected by the storm? Maybe none. But it sure has made people think of Starbucks as every bit of the warm, community brand they claim to be, in stark contrast to the unapologetic indifference of brands like American Apparel. Be it Verizon or American Apparel, there are several such instances of brands showing their compassionate side or self-serving side in the face of hurricane Sandy. By choosing to reach out to consumers during the storm, these brands could only meet one of two consequences: 1. Be lauded for their sense of customer service and gain more emotional capital; or 2. Earn people’s wrath by attempting to capitalize on a tragic situation or being unabashedly indifferent to it. In either case, thanks to social media, the side-effect is always amplification. Good deeds and bad deeds alike are amplified, shared virally and by the time a brand can react to it – acquire the status of a socio-urban legend. For instance, Radian 6 recently reported that Hurricane Sandy triggered 11.5 Million social media conversations. Imagine the kind of wanted / unwanted amplification a brand would stand to gain against this backdrop. It’s not just the sheer money-mindedness behind the sentiment displayed by American Apparel and Gap that is so controversial. What these brands seem to have completely missed is the fact that in the age of social media, for all practical purposes; they are viewed as a real person with a voice and personality by their audiences. The KIND of person they come across as, however, is their choice. 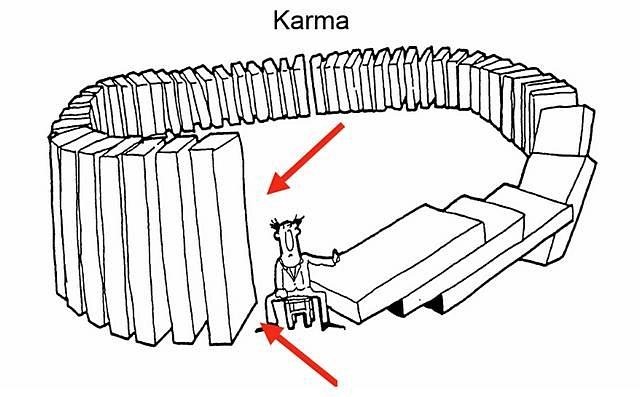 And this is exactly why brands need to have good karma. Because at the end of the day, whether it’s Starbucks checking in on their customers’ well-being or P&G dispatching Duracell charging stations and Tide laundry trucks for free assistance to hurricane victims, or Verizon waiving off charges for hurricane-hit customers, it does boil down to Karma: What goes around will come around (with amplified effect), especially in today’s socially charged digital times. And by default, it might just be time to institute and operate by a new motto of commerce – Caveat Marketer (Marketer, beware! ).